Set for its 9th annual running in 2018 along a mostly flat course that takes runners from the Los Angeles Memorial Coliseum and the campus of the University of Southern California to downtown L.A. and back, the Rock ‘n’ Roll Los Angeles Halloween Half Marathon sees runners come dressed out in every costume you can imagine — zombie Hooters waitresses, Superman, skeletons, rodeo clowns, and much, much more. The race features an out-and-back route that starts and finishes at L.A. Live, the entertainment complex located near the Staples Center, the home of the NBA’s Lakers. From there, the course takes runners on a pair of out-and-back stretches that lead away from the Staples Center and back, with the first taking runners south toward the L.A. Memorial Coliseum and Exposition Park. Runners make their way to the University of Southern California campus, turning around just before reaching the campus proper, and then head back north past the finish line and into downtown Los Angeles. The next stretch of the course brings runners into and then west of downtown Los Angeles, taking them through MacArthur Park and the Koreatown neighborhood, known as one of the most exciting places to eat in America to David Chang, world-renowned chef and founder of the Momofuku Restaurant Group, David Chang. Runners reach the second turnaround point just before reaching the Miracle Mile (near mile 8 of the half marathon course). From here, runners turn around and head back to the finish line at the Staples Center. Runners will have four hours to finish the half marathon — note that this time is according to each runner’s own personal chip time, not the overall starting gun time for the race. For those who don’t feel up to running 13.1 miles, the event also hosts a 5K race. Famous for its mild temperatures and sunny skies throughout most of the year, the Los Angeles area typically experiences moderately warm to mild conditions in the mid-fall season, as October has brought record temperatures here as low as 41°F (in 1971) and as high as 108°F (in 1987). On race day (Oct. 28), the average low is 56°F and the average high is 77°F. See the race route map for the Rock ‘n’ Roll Los Angeles Halloween Half Marathon here. To reserve your spot in 2018 running of the Rock ‘n’ Roll Los Angeles Halloween Half Marathon, register online at Active.com here. 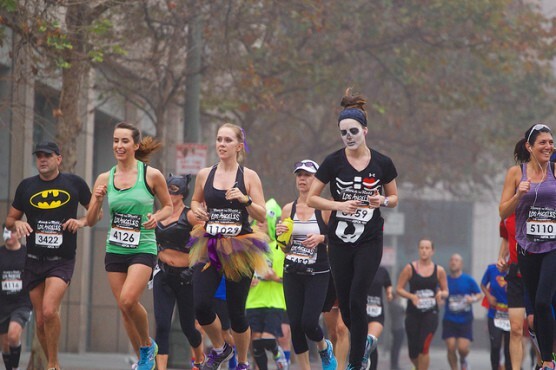 Ever run in the Rock ‘n’ Roll Los Angeles Halloween Half? Share your impressions here, or post your review in the Comments below. Credit card statement confirms I registered on 10/27/17. I did not save confirmation papers. I would like to see my photos for The Rock and Roll half marathon on October 29, 2017. Will I received them in the mail?? Thank you!!! Where are the 5K Results…w did have chip! Was unable to find my 5K results for Bib 7421 October 30, 2016 RocknRoll Event. Please advise. 5K runners did have timing chip band on shoes. How many people typically run in this race?